Growth capital is a form of financing available to relatively mature companies that are at the scale-up stage and looking to expand further. These companies are more mature than venture capital backed businesses and are often at the break-even stage or already generating some profit, but not enough to implement transformational changes such as international expansion or acquisitions. 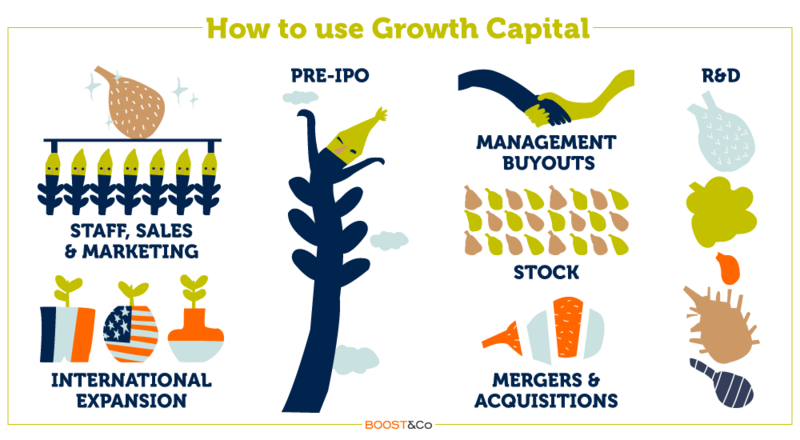 Growth capital can be structured as equity or debt. Provided as loans, this form of capital investment allows high-growth companies with a proven business model to fund growth, without equity dilution or loss of control. As such, this financing option works particularly well for businesses that are growing fast and that are committed to attaining the milestones that trigger higher valuations in future rounds of equity fundraising, or to help them reach the IPO stage. Each growth capital loan is individually tailored to meet the needs of the business and its individual situation and sector, and consists of a loan agreement, a debenture, and an equity kicker. Size: Growth capital lenders offer loans of between £2 Million and £10 Million, funded as a lump sum or drawn down in tranches as needed. Providing funding in tranches reduces the cost of capital by offering a ‘pay as you grow’ solution to companies. Duration: Growth capital loans amortise over a predefined period of between three to five years. Monthly Repayment: This can include an interest-only period of six to 18 months, followed by the amortisation of capital and interest. Each growth capital loan is designed to suit the needs of the individual business, so the cost of financing depends on the size of the loan and the use for which it is earmarked. Regardless of these factors, all growth capital loans consists of a combination of the following terms, as specified in the loan term sheet. Growth capital lenders look at a company’s future potential for growth rather than historic factors, and are therefore able to offer funding earlier and in larger amounts than traditional banks. And while the interest rates of growth capital loans reflect this higher risk, they require no covenants or personal liability clauses. Knowledge is power, and having an understanding of the criteria that lenders apply when evaluating companies for growth investment can help management teams to impress investors. We’ve outlined the primary factors that lenders examine when determining a scale-up’s eligibility for a growth capital loan. Established and steadily growing businesses — above 10% annual growth. Growth capital loans are better suited to companies with a mature business model and an established customer base, where all the fundamentals are in place and the business is ready to scale. Growth lenders will typically consider a business model as being proven when the company has achieved an annual revenue run-rate of approximately £3 Million. But for businesses where there is good visibility of future revenues, the threshold may be as low as an annual run-rate of £2 Million. The residual value of a company is the value that can be extracted from the company in a downside scenario. Lenders prefer companies with a residual value equal to or in excess of the value of the debt they are seeking. A company with no residual value will struggle to raise debt – its risk profile will be better suited to equity investment. Growth lenders prefer to work with companies that have clean business information. This is a sign of a mature management team and enables a quick and smooth funding process. Straightforward corporate governance is also crucial, as it enables a faster decision-making process for important matters within the life of the company. A clean corporate structure makes the funding process easier and faster. Contrary to common misconceptions regarding a company’s ownership, profitability and asset profile; these factors needn’t affect a company’s ability to secure growth funding. Regardless of whether they are privately-owned, pre-profit, or asset-light businesses; companies showing sufficient growth may be eligible for growth investment. Unlike bank loans, growth capital loans are available to businesses with few assets to use as collateral. 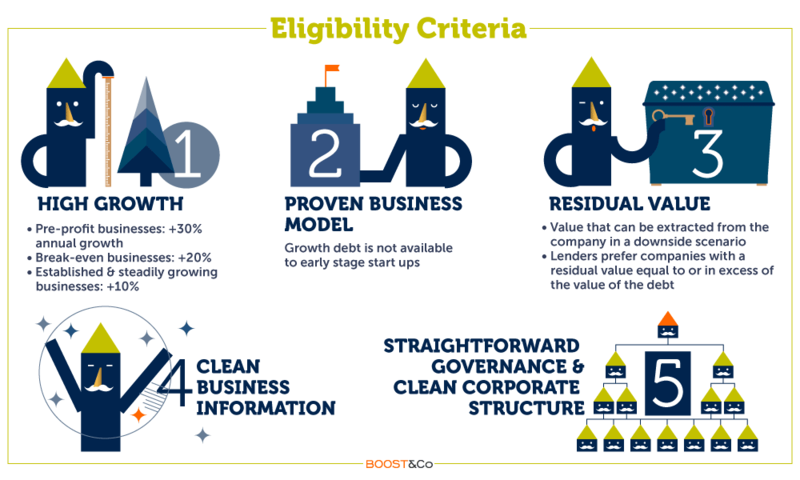 And because future growth potential is a deciding factor in eligibility, growth capital loans are also suitable for privately-owned and pre-profit businesses that meet the criteria. Growth lenders like to invest in companies when they have strong momentum and can demonstrate that trading is on the up. Lenders rely on your company’s future growth – rather than past performance – to service the debt. Strong momentum provides confidence in your company’s ability to achieve the necessary growth. In general, lenders are attracted to scalable business opportunities because they offer a risk profile that is well matched to growth debt. A scalable opportunity is one where the business is fully proven and successful, but needs additional resources to expand. For example, it may need to increase sales staff, invest in production capacity, or replicate a service in new locations. From a growth capital provider’s perspective, this is an opportunity for clear growth and controlled risk, as the company is simply doing more of what it is already very good at. High gross margin businesses are well suited to growth debt because they service fixed repayments of the debt more easily. A high gross margin is often an indicator that your company delivers high value-added services to its customers. That is evidence of the longevity of the business model and also provides some headroom for lower margins if competition increases. In addition, lenders like the fact that in a downside scenario, it is easier to support or save such companies because it is easier to act on overheads than on variable costs. Companies with low churn and good organic growth with existing customers. When approaching a growth capital investor, having evidence that you have already delivered on your business plan and achieved what you set out to, can immediately create a positive impression. This can prove vital for businesses that reach out to a growth lender six to 12 months ahead of actually being in a position to start the fundraising process. There is a large upside to delivering on your plans – or in exceeding them. Doing so is rare and lenders will give you credit for your ability to make accurate forecasts. They will feel more confident about your growth plans. 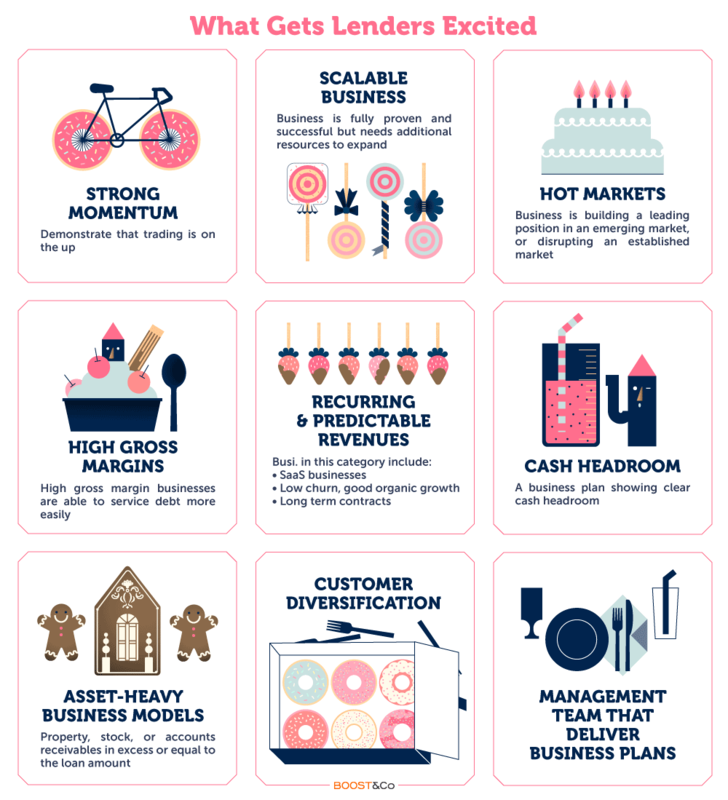 Growth capital has a variety of uses, depending on the need of the company and where it is in the business lifecycle. Scale-ups that are breaking even and growing may wish to use growth capital to scale operations, without the equity dilution associated with venture capital and equity investment. For established businesses, growth capital provides a useful mechanism to assist in reaching further growth potential. The growth capital funding process usually takes two to three months, as compared to three to six months for bank debt and six to twelve months for institutional equity. With a growth capital loan, your growth initiatives can kick off faster, without diverting excessive management time from the job of running and growing the company. Good quality information is the key to a swift process. The better prepared you are, the more impressed investors will be. And the more information you provide, the more streamlined the process. Once the growth lender has gained an understanding of your business, the next stage is to issue you with a term sheet. This is a legally-binding document summarising the key terms of your agreement. A signed term sheet from a lender means that it is on-board and keen to fund you. The likelihood of moving to funding is very high. A subordination agreement to make the lien of a party junior or inferior to those of another party. Legal documents are drafted by the lender’s lawyers and revised by the company’s lawyers. Most businesses use an external lawyer to advise them on this element of the transaction. Deviation – When there has been a significant change to the financial forecast. If your business is looking for growth capital and you are interested in gaining a deeper understanding of the costs and cash flows associated with a growth capital loan, you can download our Growth Capital Loan Calculator. This is the perfect tool to help you budget for costs and compare loan providers, to ensure you work with the lender that best understands and matches your business needs. The Clubhouse is one of London’s leading business clubs, lounges, and meeting spaces. Founded in 2012, the shared workspace provider has co-working spaces in St James, Mayfair, and Angel Court; with a fourth due to open in Holborn in 2018. BOOST&Co provided The Clubhouse with a £3.5 million growth capital loan to expand its operations and open its third and fourth locations. One of the largest independent providers of airport transfers worldwide, Hoppa provides shuttles, private taxis, minibuses and coaches to more than 3 million passengers in 120 countries, 700 gateways, and more than 7 500 resorts around the globe. With a £5 million growth capital investment from BOOST&Co, Hoppa is growing its number of destinations, expanding their product range and investing in technology development. Voneus is a wireless broadband provider that makes super-fast broadband available to customers in rural communities, where alternative services may not be available. In conjunction with a £500 thousand equity investment from Jenson Solutions, Voneus is using a £4.8 million growth capital loan from BOOST&Co to accelerate the roll-out of new deployments and to meet growing demand. Leading London telecoms provider RTX providers innovative payment and settlement solutions to the global carrier market via the integration of its platform to the cash management software of a AAA bank. BOOST&Co provided RTX with £6 million in growth capital investment to expand into new markets and develop its product range and services. B2B mobile virtual network operator (MVNO), SquareOne Network, provides SME and enterprise customers with a complete and tailored mobile phone solution. With a £3 million growth investment from BOOST&Co, the company has been able to grow its customer base – particularly among mid-size SMEs – and expand its product inventory. The Asset Exchange is a vehicle finance and pre-owned vehicle sales specialist, offering vehicle financing options to customer that would ordinarily be ineligible for asset financing solutions. BOOST&Co has provided The Asset Exchange with £8 million in growth capital to expand its operations and meet increased customer demand.